See some details of past rides here. More information is available on the Events & Memoranda page. The agenda can be viewed or downloaded here. A further accompanying report can be viewed or downloaded here. The minutes of the last meeting can be viewed or downloaded here. The last meeting of the A10 Corridor Cycling Campaign took place on 18 June, 7 for 7:30-9:00PM, at TTP, Melbourn Science Park. Following refreshments, a tour for those who’d like to see the Melbourn-Royston stretch that is now the campaign’s main focus. Our last event was a meeting on the 11th of April at the Harston Pavilion, The Limes, Harston, Cambridge CB22 7QT. Click here for a map. The agenda can be viewed or downloaded here for the April 11th meeting. The minutes of the AGM can be viewed or downloaded here. Our AGM and next meeting was on 31 January at Sartorius Stedim, Royston. The last meeting of the A10 campaign was on Oct 11, 7 for 7:30, at Royston Town Hall. More detail will be posted closer to the time. Dec 10, 10:30AM, second annual Sponsored Santa Ride around Royston. Family friendly, dress in Santa gear. Detail on the front page. The last meeting of the A10 Corridor Cycling Campaign took place on 20 October, 7 for 7:30PM, at Royston Tesco. This is a short cycle ride from Royston Station. Please come to the main entrance and you’ll be directed to the meeting room. An agenda can be viewed or downloaded here. The annual A10 Awareness Cycle Ride will took place on the morning of Sunday May 15. A poster can be viewed or downloaded for printing here if you wish to put one up at your place of work etc. It has been decided that the Royston-Melbourn segment is too dangerous to include on this year’s ride. We are continuing to work for a safe link to Royston, our nearest market town. The minutes of the last meeting can be downloaded below. Our last event was our Sponsored Santa ride. Sponsored Santa Cycle Ride, 12:15, Saturday December 19th, Royston Station, main cycle park on station entrance side. Please bring friends and family, dress up in as much Santa gear as you can muster, and meet for a cycle tour of the Royston Sustrans route. (You can bring bikes on the train from Foxton, Shepreth or Meldreth Stations; trains arrive at Royston at 12:15.) The event should take about 30 minutes at most. This will be a sponsored cycle ride with proceeds going to the A10 Corridor Cycling Campaign ‘A10 Missing Link’ fund which will be held in the A10 Corridor Cycling Campaign Building Society account. A sponsorship sheet is available to download below. This event must be high profile, high impact: please mark the date in your diary and plan to be there – and bring half-a-dozen people with you! A link to our JustGiving page, can be found here if you prepare to donate online. The AGM agenda can be viewed or downloaded here. The AGM report can be viewed or downloaded here. The meeting agenda can be viewed or downloaded here. Minutes of the previous meeting can be viewed or downloaded below. Our last meeting was on the 7th of July, AstraZeneca Cambridge Road, Melbourn. Our last meeting was on January 29th at Sagentia, Royston Road (A10), Harston Mill, Harston, CB22 7GG. The agenda can be viewed or downloaded from here. Many thanks to Sagentia for hosting us. Our last meeting was the 2014 AGM on October 15th at Coombes Community Centre, Burns Rd, Royston, Hertfordshire, SG8 5PT. Minutes of this meeting can be viewed or downloaded here. An agenda can be viewed or downloaded from here. The annual report can be viewed or downloaded from here. The last meeting minutes can be viewed or downloaded from the post below. Our last event was our annual awareness ride. The annual A10 Awareness Cycle Ride will take place on Sunday May 18th. Two cycle groups will set off simultaneously at 10AM, one from Trumpington Park and Ride and one from Royston Heath, convening at Phillimore’s Garden Centre at around 11:15. Julian Huppert MP will see off the Trumpington cyclists, while Oliver Heald MP will see off the Royston cyclists. Once again, we are very grateful to the Clark family for allowing us to gather at Phillimore’s. We’ll be a bit further back from the road than last year, in the field on the left as you come in. Tea and cake will be provided free of charge, thanks to a grant from JR Tech in Shepreth. 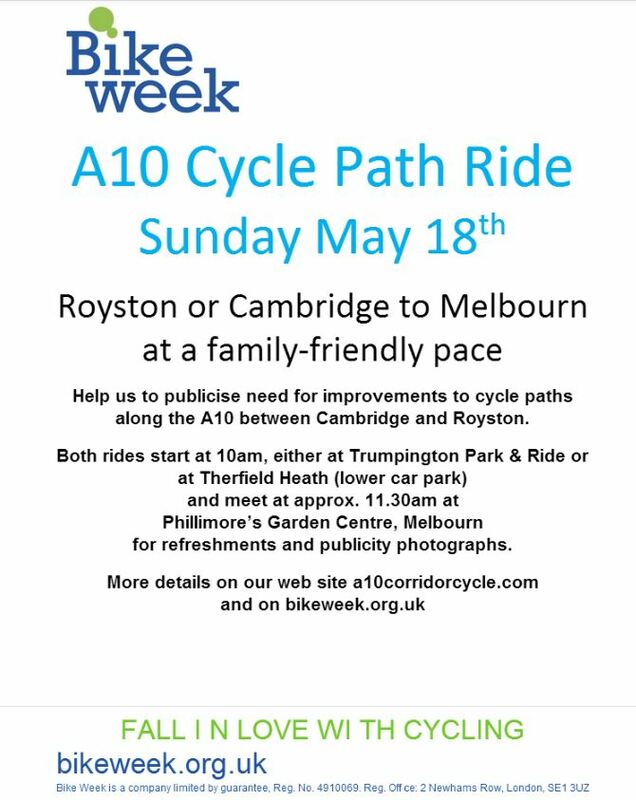 The ride will proceed at a leisurely pace, the idea being to highlight the need for a safe and good quality off-road route between Royston and Cambridge and the villages in between. The last meeting of the A10 Corridor Cycling Campaign was on April 2nd, 7:30-9:00, at the Melbourn Hub. Previous minutes can be downloaded below. The AGM date was September 24th, 7 for 7:30, Foxton Village Hall, Hardman Road, Foxton, Cambridge, Cambs, CB22 6RN. Click here for a map. The maps shows the centre of the postcode. Continue to the end of Hardman Road for the Village Hall.